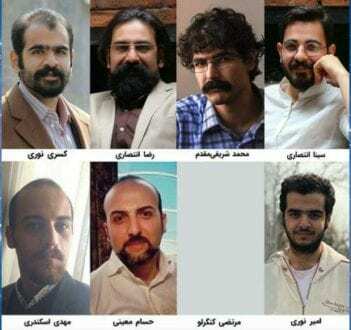 Shabtabnews – 50 days has past without any information about the physical and psychological condition of the eight Gonabadi Sufis, who were detained at the Fashafiyah Prison, before being attacked and beaten last month by the prison authorities, who were then transferred to an unknown location. No one has heard from them since their transfer and there is a growing concerns regarding their physical and mental health. Meanwhile there are number of growing contradictory news reports from the within Fashafiyah Prison concerning the eight Sufis. The only news from prison authorities of Fascophiyeh conveyed to the families of the eight Sufis is that there are being kept in solitary confinement pending new judicial case being opened against them; but the Sufis are still refused any form of visitation from their family or legal representative. The Sufis were all arrested and imprisoned after the February protest and have all been sentenced to long term imprisonment and exile following illegal hasty public trials that was concluded in less than half an hour.